Crop a picture to trim away outer edges that are unnecessary. To remove the background of a picture, see Remove the background of a picture. To make a picture bigger or smaller, see Change the size of a picture. In addition to basic margin-cropping, you can also crop pictures to specific shapes and aspect ratios, or crop picture fills inside a shape (in Office for Mac and in Office 2010 and later). Right-click the picture, and select the Crop button that appears. 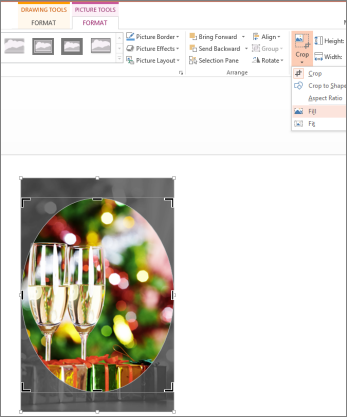 You can also outcrop, or add a margin around a picture, by dragging the cropping handles outward rather than inward. (Optional) To reposition the crop area, either change the crop area by dragging the edges or corners of the crop rectangle, or move the picture. When you're finished, press Esc or click anywhere outside the picture within the document. 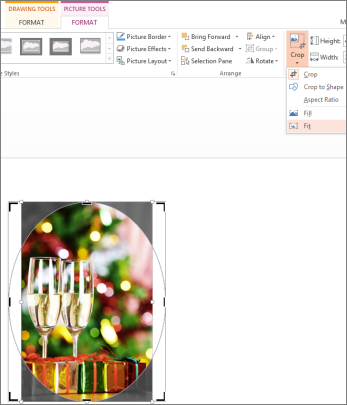 Note: Cropping tools are not available for shapes, but in Office 2010 and later, you can resize a shape and use the Edit Points tool to achieve an effect similar to cropping or to customize the shape. See Crop to fit or fill a shape below for more information. You may crop multiple pictures at once, but you must crop them to the same shape. To crop to different shapes, crop the pictures individually. Click Picture Tools > Format, and in the Size group, click the arrow under Crop. 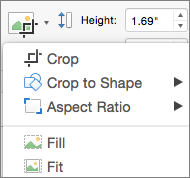 From the menu that appears, select Crop to Shape, and then click the shape you want to crop to. If you want to adjust the shape, click the Crop button on the ribbon. Click the Crop button again when you are done. Cropping﻿ a picture to a common photo size or aspect ratio lets it easily fit into a standard picture frame. You can also use this tool to preview how a picture will fit into a specific aspect ratio before cropping. From the menu that appears, select Aspect Ratio, then click the ratio that you want. A crop rectangle appears, showing you how the picture will appear when cropped to the selected aspect ratio. If desired, adjust the crop area ﻿using the cropping handles as described under Crop a picture. You can add a picture as fill for a shape and then edit or crop the shape. Add a shape to your document (see Add shapes for instructions) and click the shape to select it. Click Drawing Tools > Format, and in the Shape Styles group, click Shape Fill > Picture. Select the type of picture you want (such as From a File or Online Pictures) and then navigate to the picture you want and insert it. To change the filled shape's dimensions while maintaining its basic format, select it and drag any of the sizing handles. Click a shape created using Shape Fill > Picture. Click Picture Tools > Format, and in the Size group, click the arrow under Crop. A menu appears showing cropping options. Choose Fit if you want all of the picture to fit within the shape; the original picture aspect ratio will be maintained, but you may have empty space inside your shape. Choose Fill to have the shape fit within the bounds of the picture, cropping away everything outside the shape. Fill sets the picture size to match the shape’s height or width, whichever is greatest. This fills the shape with the picture while removing anything outside the shape's perimeter. Fit sets the picture size so that the picture’s height and width both match the shape’s boundaries. This fits as much of the picture into the shape as possible, but some areas of the shape might remain empty. You can drag the picture to change what part shows within the shape. Although cropping tools are not available for shapes, you can use the Edit Points tool to edit a shape manually. Select the shape that you want to edit. 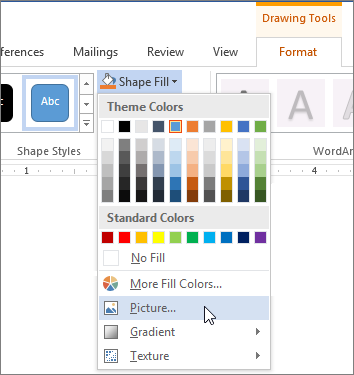 Click Drawing Tools > Format, and in the Insert Shapes group, click the Edit Shape button, then click Edit Points. Drag the shape's vertex points (which appear as black dots around the shape's perimeter) until the shape looks the way you want. To delete a vertex point, hold Ctrl and click it. To add a vertex point, hold Ctrl while clicking anywhere on the perimeter of the shape that does not already have a vertex point. Both the Paint (in several versions of Windows) and Paint 3D (in Windows 10) apps help you crop a picture. Open your picture in the app, and you'll see a Crop button on the toolbar. See this quick video overview about some features in the Paint 3D app. After you crop a picture, the cropped areas remain part of the file, hidden from view. You can reduce file size by removing the cropped areas from the picture file. This also helps prevent other people from viewing the parts of the picture that you have removed. Important: If you delete cropped areas and later change your mind, you can click the Undo button to restore them. Deletions ca be undone until the file is saved. Select the picture or pictures from which you want to delete cropped areas. Click Picture Tools > Format, and in the Adjust group, click Compress Pictures. A dialog box appears showing compression options. If you don't see the Picture Tools and Format tabs, make sure that you've selected a picture. You might have to double-click the picture to select it and open the Format tab. Also, if your screen size is reduced, you might only see the Compress Pictures icon. 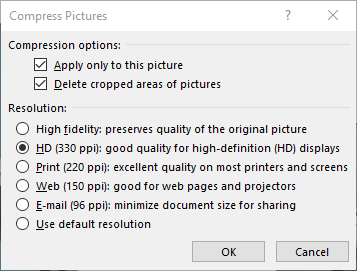 Under Compression Options, be sure that the Delete cropped areas of pictures check box is selected. To remove croppings for the selected picture or pictures only and not all pictures in the file, select the Apply only to this picture check box. Select a Resolution option, if desired. Tip: For more information about reducing the file size of pictures and compressing pictures, see Reduce the file size of a picture. Right-click the picture and select Crop. On your slide, right-click the picture, and then click Crop. Place your cursor on one of the black cropping handles that appear on the edges of the picture. To crop each side, drag the black cropping handle inward. When you are finished cropping, press Esc or click away from the picture. 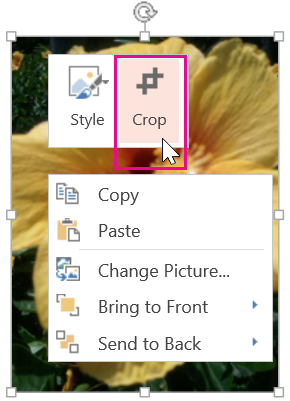 Or, in OneNote Online, select Crop to complete the cropping process. Note: After you crop a picture, the cropped parts remain as part of the picture file. To permanently remove the cropped portion and reduce your picture size, open the file in your desktop app, and see Delete cropped areas of a picture.